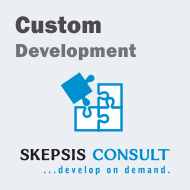 you can make the payment directly here, after receiving a project quote from us, "thePHPfactory" part of SKEPSIS Consult SRL. On this page - please fill in the Quantity, to match the project quote! Example: if you have to pay 350 €, then enter Quantity 35. (Total Amount to Pay) 350 € = (Initial Unit) 10 € x (Quantity) 35. Example: enter "CW 104.030 for License 22336", meaning: Custom Work according to Ticket 104.030 for Product License 22336. (Enter the license number, only if it's a custom work on one of our products). After the payment was made, we will start working on the project as established when the quote was issued. Please follow further the initial ticket were the project quote was issued, under User Menu / My Tickets. so that we can provide a safe code and fully optimized to use minimal resources. Thank you for the confidence in our services! 6. final Feedback and Project closure.